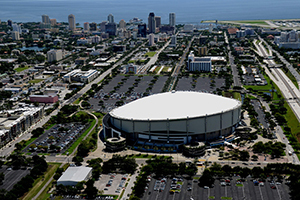 Incore Residential - Incore purchases new office space in downtown St. Pete’s trendy Dome District. As part of its ever-evolving presence in the multifamily arena, Incore Residential has purchased a 2,900 square foot office building to serve as the new home of Incore Residential, Mosaic Development and Rental Link. We were able to negotiate a favorable purchase price for an office building located in a highly sought after section of downtown St. Petersburg. The building is just blocks away from the Rays Tropicana Stadium, and in an area of downtown that has recently been transformed by new and unique restaurants and trendy boutique shops. The main office space was built in 1933 and expanded upon in 1991 to add additional office space as well an upstairs apartment. The entire building is undergoing a complete interior rehabilitation that will fully transform the office into a modern, stylish work environment with both enclosed office and open work space. The entire office will be technologically built-out with wi-fi service throughout and Cat5 and cable wiring in each office and work area. The new conference room will have 7-foot sliding glass panel doors that open to a brick courtyard that can be used for break space, client entertaining, or after-work gatherings. Keep an eye out for our grand opening party in December 2015!